One of the first big decisions you’ll have to make about your pregnancy will probably come at that first appointment. That’s the decision whether or not to have prenatal testing or screening done. I strongly recommend doing your research before you go as it’s hard to make a decision on the spot. Ask questions and have them explain things if you don’t understand. None of the information in this post or on this website should be used in place of medical advice. These are simply my opinions and insights based on experience and research. This post contains brief overviews of prenatal testing. If you have specific questions concerning a test or the results please consult your healthcare provider. The first thing that needs to be said before we dive into prenatal testing options is that genetic problems are rare. Around 97% of babies are born healthy according to Stanford Children’s Health. Only 3-4% of babies are born with a birth defect. This is post 5 in my 31 days of tips for moms-to-be series. The first question you may want to ask is whether or not your insurance will cover the testing. It can be quite expensive if it does not. For instance, my insurance does not cover most testing as I’m under 35. Often insurance will only cover the costs if you are considered to be in a high-risk population. The NIPT is a blood test that looks for placental DNA within the mother’s blood. Any risk factors detected would need to be verified through further testing. While negative results are generally correct, false positives are somewhat common (depending on the disorder being tested for). 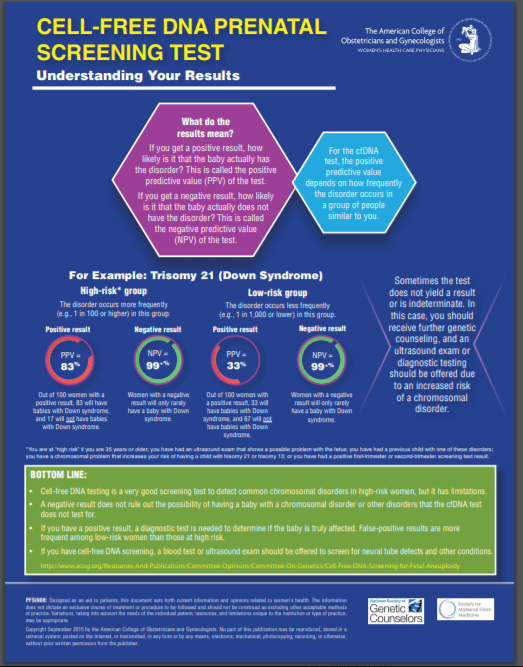 The major conditions this test screens for are Trisomy 21 (Down Syndrome), Trisomy 18, and Trisomy 13. Your care provider may refer to this test as the Harmony or Panorama test. These are simply two of the big companies that do these tests. While many of these other tests can tell you the gender of your child, along with screening for certain disorders, the Sneak Peek test is simply an elective test to find out the gender of your child. The test is done at home and mailed in. You then receive your results via email. The test is supposedly correct 99% of the time. However, I know at least one person in my mom group who had the result come back wrong. There is a risk of the test being contaminated by other DNA in your household which could lead to an incorrect result. The test can be done as early as 9 weeks. Generally, you have to wait to find out the gender at your 20-week anatomy scan, so this will potentially let you know a bit earlier. Chorionic Villus Sampling or CVS takes tissue from your placenta to test your baby for genetic abnormalities. It cannot identify neural tube defects such as spina bifida. This test is usually used only if another less invasive test comes back with a positive result. It may also be recommended in higher risk pregnancies such as advanced maternal age or a family history of a specific condition. There is still a small chance of a false positive where it says a disease is present when it is not. The test is usually done between weeks 11-14 of your pregnancy. You can read more about this test on the Mayo Clinic website. Amniocentesis is probably the test that is most heard of. It’s somewhat similar to the CVS test discussed above but it’s done later in the pregnancy, between 15-20 weeks according to the Mayo Clinic. Amniotic fluid is removed from the uterus to test for genetic abnormalities. This test used to be much more common, luckily with all the other developments in prenatal testing, it is now reserved for those who’ve had a positive result on another test. It may also be used to determine if the baby’s lungs are developed enough for birth in the event that a baby needs to be born early due to a health complication with the baby or the mother. The quad screen is generally performed between 15-18 weeks but can be done up to 20 weeks of pregnancy. This screening is done by taking a blood sample of the mother so it’s considered to be non-invasive and carry no risk to you or the unborn baby. It measures four different substances to test for Trisomy 21 (down syndrome), Trisomy 18, Spina bifida, and Anencephaly. The test results will give a probability that the unborn child will have one of these conditions. There is about a 5 percent chance of a false positive. It can also miss positive results. According to the Mayo Clinic page on the quad screening the test correctly identified 80 percent of women carrying a baby with Down syndrome. While most of us think of the anatomy scan as the gender reveal or confirmation scan it’s main purpose is to check on the health of the baby. This ultrasound will be long, the length of time will somewhat be determined by how cooperative the baby is. If the baby isn’t in a good position your may even have to come back for a second scan. They will measure all aspects of the baby and check out all the major organs and structures to ensure the baby is developing correctly. They will also tell you the gender if they can get a good shot. The scan is generally done by a radiologist, they will not be able to tell you anything about the results of the scan, instead, your doctor will review it with you at your next appointment. If you want to know more about the anatomy scan? Read this account by a doctor about what to expect at this appointment. The benefits of prenatal testing are twofold. First, it gives you the opportunity to terminate the pregnancy if the baby has a condition incompatible with life or that will result in severe disabilities. If your tests are positive you will be given the opportunity to speak with genetic counselors and other professionals who can give you in depth information on the results. It can also give parents and doctors extra time to prepare to care for whatever conditions the child has. For some conditions, like spina bifida, treatment can even begin in utero. Personally, we choose to skip all the early testing and wait for the anatomy scan. My husband and I know that we would not choose to take action to end a pregnancy if issues were found so we choose to enjoy the pregnancy and wait until the anatomy scan to look at the health of our baby. We also have no history of major genetic conditions making us low risk for any issues. Whether or not to have testing done is something that only you and your spouse/partner can decide. We have never been pressured by any doctor to do the testing, however, we do have to sign a form saying we have waived some of the routine tests. While the noninvasive blood tests like the NIPT and Quad don’t carry risks to the physical health of mom or baby they can cause undue stress and anxiety. A positive result always needs to be confirmed by other, more invasive testing. They also carry the risk of a false positive where the test falsely indicates a problem. Either way, there will be added stress while another test is performed to confirm or negate the results. If you do have testing be sure to have your doctors explain the results in detail before making any decisions. I highly recommend having a second test to confirm any positive results due to the possibility of errors. The good news is most genetic abnormalities are rare! As I mentioned at the beginning of this post, around 97% of babies are born healthy. I hope this post shed a little light on the different types of prenatal testing available. There are certainly a lot more options that when our parents were having us! 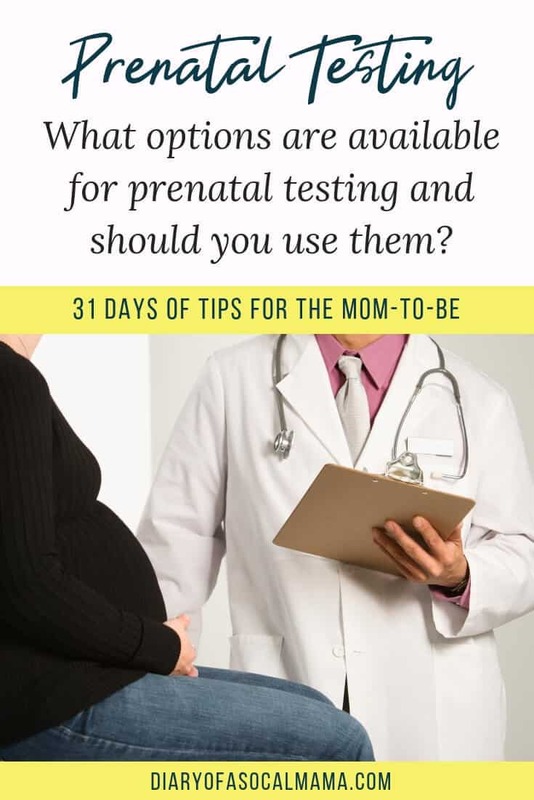 Visit the 31 days of tips for moms-to-be page to see all the subjects and sign up for email alerts.